Make these free printable children's books to encourage your kids to read. There are a variety of themes to choose from -- the majority of the books target younger readers (preschool, kindergarten and early grade school) although a few of the books are a bit more challenging. The "custom stories" and holidays themed stories are especially popular! 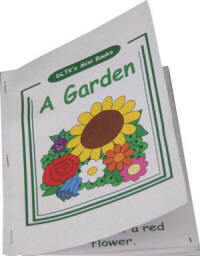 The printable books come with suggestions for complimentary activities and/or worksheets to reinforce the stories. Here's a suggestion from JoAnna: "I was trying to keep my 5-year-old busy the other day and came up with a fun craft reading project. I gave him 6 blank pieces of paper and told him to draw a different picture on each one. When he was finished, I asked him what each picture was. Then I put together the pictures and wrote a story based on them. Arien REALLY loves his book because it is about his father and he is very proud that it has all of his drawing in it. I enjoyed trying to tie all of the pictures into one story (and the free time I got while he was drawing)." Here is a suggestion from Carlene and Paris: "Being an avid quilter, I came up with my own way of putting the mini books together. I sew them together on the sewing machine. No staples or brads are needed. It works for me." Here is a suggestion from Carol: "If printer resolution is high enough, the mini book pages can be reduced to 70%-75% before printing each page. Then they can be inserted into a mini photo album. That way the books may hold up to more wear and tear with younger children."